Kate Gilmore’s sculptural and performance-based works raise questions about feminine identity and contemporary power dynamics. Wall Bearer, the park’s current Broadway Billboard, is documentation from the eponymous performance at The Weatherspoon Art Museum in Greensboro North Carolina in 2011. 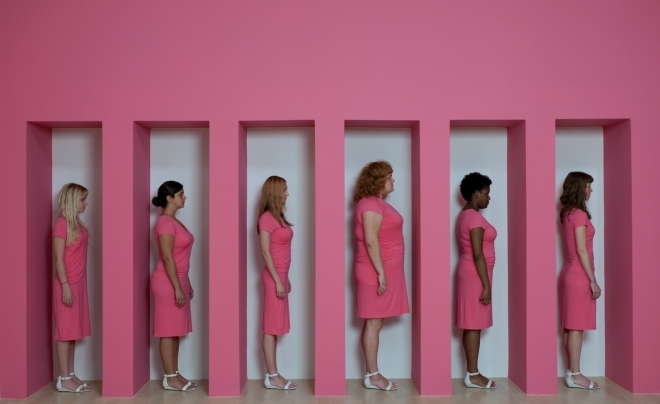 For that project, six performers, dressed in identical pink outfits, stood in individual alcoves within a matching pink wall. The performers, all women, stood perfectly still for three hour stretches, during which time visitors to the exhibition could walk through the space, viewing the performance as a still-life or a sculpture to be briefly admired. In Wall Bearer, the live female body is transformed into a sculptural element, referencing 1970′s performance art and later feminist artworks. Here Gilmore presents a parade of pink and a rotating cast of all-female performers. The pink’s Pepto-Bismol-like hue borders on saccharine and feels imposed and thus unattractively burdensome for each woman. Camouflaged, anonymous, and uncomfortable, each woman may be a column of support and essential to the overall tableau, but she is also easily overlooked, suggesting that there is more than a physical wall to be overcome.